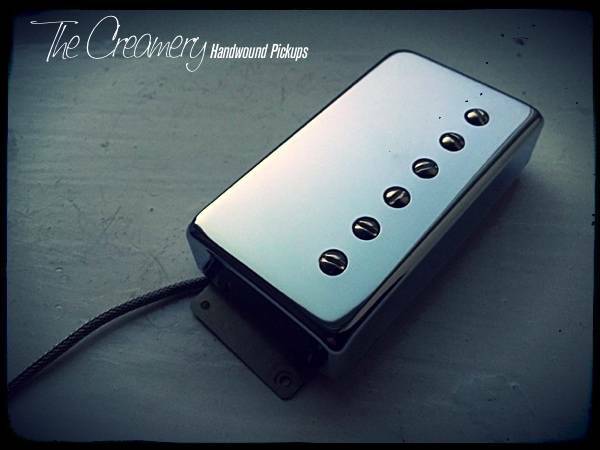 Replacement Creamery '59 Humbucker Pickup in the larger fender Wide Range Humbucker Size - Alnico 2, 3, 4 or 5 for those classic/vintage humbucker sounds. Direct drop-in replacement. A slightly higher output than the Creamery '57 with a little more in the mids and slightly smoother in the highs but still with that classic, vintage rich warm sound with great harmonics & definition. A real creamier humbucker sound when overdriven. As with all my humbucker pickups, the coils are asymmetrically wound giving more dynamics, clarity & string definition. A rich, vintage sound. Available in chrome, nickel or matte/aged Fender Wide Range size covers.